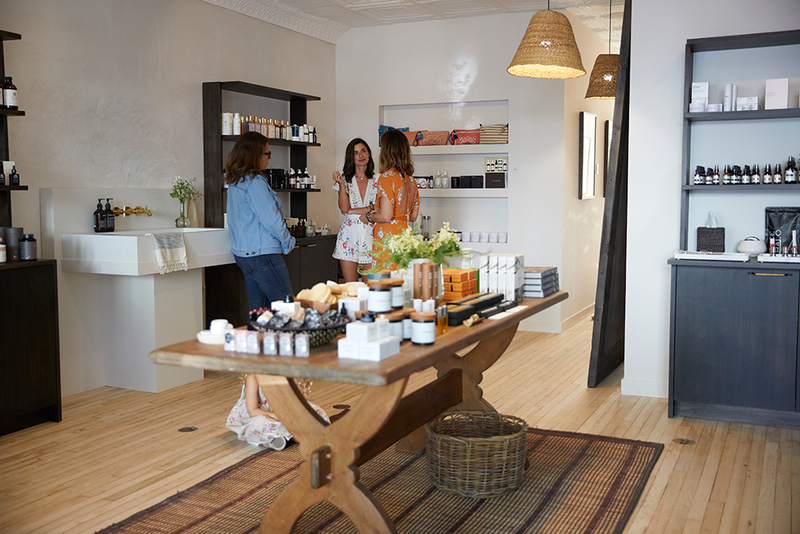 Another amazing addition to Sag Harbor town is ONDA Beauty, founded by three very health-conscious women aiming to change the beauty game. Larissa, Naomi and Sarah have joined forces to create a space for women to visit that is both relaxing and zen. The goal being to eliminate all of the toxins we put on our bodies daily, and find the best, clean, all natural products to replace them with. They sell everything from natural makeup to lotions, bath products, cleansers, and herbal remedies. They have a wealth of knowledge when it comes to their products, and help find the perfect regimen for each individual customer. ONDA Beauty has the most incredible aestheticians working in their treatment rooms, doing custom facials everyday, and the backyard serves as a relaxation space designed by Urban Zen. My favorite of their products is the Lord Jones CBD lotion to soothe muscle aches and pains. Not only do I love the scent, but it actually has worked to heal my Achilles after a recent injury, so I am thankful they turned me on to this product. How many years have you been in business in NYC and the Hamptons? When I left fashion magazines, I knew I wanted to start something of my own in the wellness world. It seemed crazy to me that so many people were focusing on making sure that what they were putting IN their bodies was clean, healthy, organic, etc., but not what was going ON their bodies. What we put on our bodies impacts our health and the health of our families just as much as the food we eat. I learned that there were few FDA regulations in place banning toxic ingredients from our personal care products, plus there are harmful ingredients in some products that are linked to illnesses such as cancer and many others. I decided to create a space that would feel warm, inviting and be a respite from the urban environment. A destination that affects all your senses in a positive way, where people could either be educated about clean beauty options or just simply rely on ONDA to recommend healthy, effective and toxin free products. I think we create an environment that feels safe and knowledgable. It's our priority to give each customer curated service addressing that person’s individual needs whether they are buying products or receiving one of our treatments. We also try each product that we stock so that we can speak first-hand to the benefits of all and why we have chosen to stock that item. We customize our selection very carefully with a variety of things in mind. We do the work so our customer doesn’t have to. I think creating the ONDA environment in each shop. I love interiors and design, but in a way that feels eclectic, natural, warm and inviting. Creating a space that people love to keep coming back to is what I really love to do. That and talking to people one-on-one to help them find products that are a good fit for them. I love being a matchmaker, but for me, I am matching people to products that will be effective, beneficial and appealing to them. Products that will give them the opportunity to really enjoy the experience of taking care of themselves. Probably my bathroom. LOL! I love my bathroom, it feels more like a sanctuary to me. I have many personal items like art work I love, crystals, a Moroccan rug, and even some teak furniture. It’s where I decompress at the end of a long day whether I'm taking a bath, a long steamy shower or just using products that I love, that help me relax. If I had to say somewhere outside of my bathroom it would probably be The Dutch Flower Line in the flower market district. It is heaven in there. Go and you’ll understand immediately what I’m talking about. We have so many moms that come in and tell us that we have helped them to carve out time for themselves. There is real benefit to knowing that every product ONDA carries is safe, so moms can spend the little time they have creating self-care rituals for themselves instead of researching ingredients. It still blows my mind how many moms come in and tell us that the experience of just being in the store is restorative to them. We love hearing that! "You changed my life." About the products we recommended for a customer. It was as simple as that to her. And everything for us to hear. My old friend Suze Yalof Schwartz (founder of Unplug Meditation) once said to me I’d rather say "oh well" than "what if." It's funny how many times I find myself thinking that or sharing those words with others. Life is too short to not take risks. That and never let fear rule your choices. Maybe its the same thing. I would say it’s actually learning how to stop and take the time for yourself. I try not to constantly be rushing and trying to fit in more and more, but to recognize my limits and slow down, be present. With the amount we are all trying to accomplish in a day it’s more challenging to stop than to go faster or do more. Take the time to be with yourself, your family, your friends. When we do slow down we are able to do the thing in front of us much more efficiently. That’s the game changer.